Battle Creek, MI – Usually an anticipated time of fun-filled family festivities, the Fourth of July was anything but a day of celebration for the family of Cree Erwin. In the early morning hours, Cree’s mother, Tanya, made a gruesome discovery. Her daughter, Cree, lay dead in Tanya’s own bed, cold as ice. 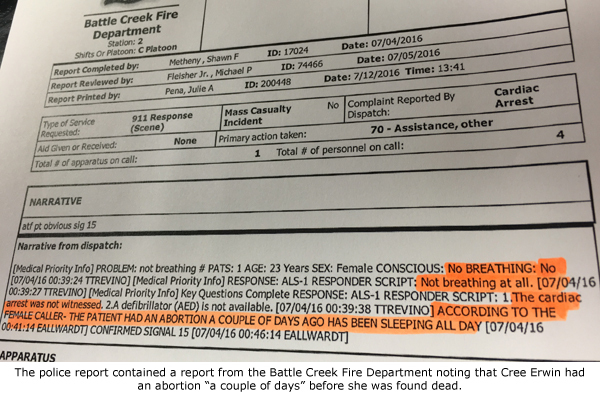 While important questions remain, 911 records just obtained by Operation Rescue, along with a police report provided by long-time Michigan pro-life activist Lynn Mills, shed a bit more light on what happened to 24-year old Cree Erwin in her final hours of life as she struggled with complications to an abortion she had less than four days earlier. The records also reveal a mother’s unspeakable grief at discovering her daughter’s body – gut-wrenching grief that no mother should have to experience – the cruel loss was compounded by the fact that this young lady’s death was avoidable. The grief in this mother’s voice is reflective of the true toll abortion takes on families, especially when something goes wrong. “Listening to this 911 call, it becomes clear that we cannot continue to allow abortion to take such a devastating toll on families, communities, and society. The loss of this young lady’s life must not be written off as the cost of ‘choice.’ This price has been paid by far too many families, and we, as a people, cannot afford the bill,” said Troy Newman, President of Operation Rescue. It began when Cree reported to a still unknown abortion facility on June 30, 2016, for an abortion. But something obviously went wrong. Cree began to experience intolerable abdominal pain. On the night of July 2, Tanya took her suffering daughter to the emergency room at Bronson Battle Creek Hospital. There, Cree was supposedly given pain medication and told to see her family physician the next day. She was discharged just after midnight on the morning of July 3. Tragically, she didn’t live long enough to get to her own doctor. Still in severe pain and afraid to go home where there was no one to help her, Cree decided to stay at her mother’s house, which was just blocks away from the hospital. Tanya had Cree sleep in her bed with her in her basement bedroom, but Cree was in so much pain that she crawled into bed crossways and did not want to move any further. When Tanya got up in the morning, she thought Cree was still sleeping. In the afternoon of July 3, Tanya checked on her on her daughter once again. She appeared to be sleeping but her breathing seemed labored, like someone with sleep apnea. Officer T.M. Wirebaugh, who responded later to Tanya’s frantic call for help noted in his report that he believed that Cree could have been experiencing agonal breathing. Recognizing agonal breathing can be difficult, because it resembles normal respiration, according to the website EMSBasics.com. Agonal breathing is short gasps that are inadequate to maintain proper oxygenation and is a sign of severe physiological distress requiring immediate emergency medical treatment. It sometimes accompanies a heart attack and is a sign that death is eminent. Cree’s mother had no way to know that. With Cree still appearing to be asleep, Tanya let her rest. Tanya decided to turn in shortly after midnight on July 4, and found her daughter still laying across the bed on her side. She tried to get Cree to move, but she couldn’t get her to wake up. She began “shaking and yelling at” her daughter, trying to rouse her, but nothing worked. She realized Cree wasn’t breathing and was cold to the touch. Distraught and crying, Tanya phoned 911, which began recording her sounds of grief even before the dispatcher answered the call. “What’s going on?” the dispatcher demanded. With that, the dispatcher assured the grieving mother that help was on the way. Within moments, paramedics and police arrived. According to the police report, it only took the medics about 15 seconds to determine that Cree Erwin was deceased. With their difficult job done, the medics left the scene and police contacted the medical examiner’s office. The police were provided with Medical Examiner Case Number 0704-16-JC-207-CC. A Crime Scene Tech was dispatched to the scene, which he photographed, but no evidence was collected. Later, an autopsy was performed. The police inquired about several bottles of prescription drugs that were found in the bedroom, which were prescribed to either Tanya or her husband. There was no mention of the pain drugs that were supposedly given Cree Erwin by emergency room staff. “While drug overdose remains a possibility, the fact that Cree was incapable of even adjusting herself on the bed makes it appear unlikely that she got up and took drugs,” said Newman. Cree’s one-year old son was left in the custody of Tanya and police advised her to go to court to get legal custody of the boy. 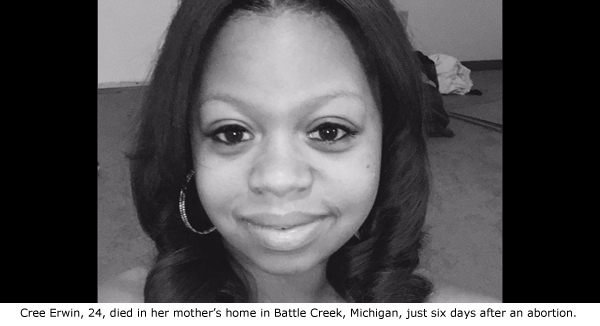 Cree’s grief-stricken family and friends gathered for her funeral ten days later. •	Where did Cree Erwin obtain her abortion? •	Did she have a surgical abortion or was she given the abortion pill? •	Who was the abortionist responsible for the abortion? •	What was the official cause of death? •	How culpable is the hospital that discharged Erwin, who was just hours from death? •	What was the result of the homicide investigation first reported by a local news station? Operation Rescue was told last week by the Battle Creek Medical Examiner’s office that neither the autopsy report nor Erwin’s cause and manner of death would be available for 30-60 more days. In the meantime, a death certificate obtained by Lynn Mills notes that her cause of death is pending an investigation. The nearest abortion facility is the Planned Parenthood in Kalamazoo, just about a half hour away from Battle Creek. Operation Rescue has confirmed that it conducts both surgical and medication abortions on Thursdays, the day Erwin had her abortion. Another facility that is an hour and 20 minutes driving time from Battle Creek is the Planned Parenthood in Ann Arbor. That facility also conducts surgical and medication abortions on Thursday, Operation Rescue has confirmed.